You may be wondering why a society that aims to promote critical thinking is also offering counselling. Very simple; we do not believe in the majority of counselling methods on offer. The majority of approaches are based on outdated theories, most of which have no evidence to support their claims. Our critical analysis of such approach concludes that many of these counselling approaches are based on unfounded beliefs and therefore have no more validity than any other belief being it religious or new age. However we are not critical of counselling, as long as the client is aware of what he is going to experience before deciding to pay for counselling. The majority of people buy counselling sessions without knowing what the product consists of. It is no different from going to a supermarket to buy canned food without knowing what is inside the can. So we took upon our shoulders the responsibility to inform the consumer. Counselling offers an opportunity for a client to open up with a professional that is trained to listen and not make judgements. In a positive note, counselling is important as it provides the clients with a safe space where they can unburden their worries to a stranger that is not going to offer unrequested advice or force their beliefs upon the client’s. On a negative note, there are so many different approaches to counselling and so little information about what each one of them consist of it is difficult for clients to choose the approach that best suits them. Each webpage advertising a particular school of counselling will promote the benefits of their own methodology. Our society is progressing to the proliferation of loneliness and isolation. This is a factor that makes counselling popular. Nowadays one doesn’t need to suffer from any mental ailment to have some sessions with a counsellor. Sometimes people just go through a difficult path in their lives and simply need someone to listen to them. The simple act of active listening can provide great therapeutic effects. The counsellor does not produce diagnostics of personalities and does not attempt to fix the client. Our approach to counselling adopts the basic skills used in counselling. We provide a safe space for the clients to open up and share the issues that are creating emotional tensions or confusion. Our counselling approach simply helps the clients to analyse their issue from a rational point of view. We all know that emotions blur rationality, and this is why sometimes we need to talk to someone who is not emotionally involved in our problems and therefore can be objective. Our family and friends are often biased towards their own opinion and are influenced by the emotional bonds that connect you to them. It is difficult for them to be objective and proximity is not always rational. Parents may want to protect their children from the dangers of the outside world, but without experiencing those dangers, children cannot learn how to deal with them. It is a well-known fact that we learn best from experience and very often our mistakes or disastrous decisions contribute to the development of maturity. Counselling helps with dealing with the undesired outcomes of many of our decisions, but not everything that happens to us if the result of our own doing. The world is full of “others” who interact with us and shape our behaviours. The world is also full of events that we have no control over and can have an impact on our lives, and in these situations, talking to a counsellor can be of great help. But for us as critical thinking counsellors, we believe that providing a safe space and a listening attitude is not enough. We want to jeep you to apply critical thinking tools to analyse your life and make rational decisions. However we are not computers that work under particular fixed rules or psychological algorithms. We are also human beings, endowed with empathy and trained to listen without judgement. Counselling is a dual relationship where one person pays another to listen. The listener is called a counsellor when it has been trained and is official recognised by some professional bodies which require compliance with an ethical framework. However we have some doubts about the quality of such training and the know-how requirements of such professional bodies. However the counselling education lacks the provision of essential types of knowledge that are critical in understanding human behaviour. Many, counsellors are not familiar with the importance of the scientific method applied to human psychology, cognition and neurobiology, and all are oblivious to the need to understand evolution applied to explanation of behaviour. This last area is usually referred to as human ethology or evolutionary psychology. 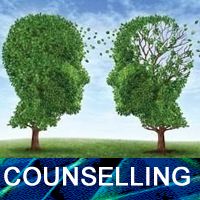 Our approach to counselling is unique in the sense that we take advantage of the recent progress in these scientific areas to make sense of what is going on inside the human mind and therefore we help the client to understand and become aware of the mechanisms that forego inside the brain and shape human behaviour. We stand for the claim that the path to understanding and knowing ourselves requires a tour through the halls of science. The main counselling streams presently advertised in the counselling market follow three main families of thought. The psychodynamic school is based on Freud’s psychoanalytical theory and offers his personal interpretation of the mind was. Note that Freud did not do any experiments nor did he collect any evidence to support his deliberations. The same can be said by his followers. Many of which, aware of the negative press towards psychoanalyses, changed some principles and called it psychodynamics to make it sound more modern. Still, other than basing their practices on some philosophical unfounded theories, psychodynamics doesn’t really have any evidential support to show that it works and helps anyone. Actually, the concerted opinion of scientists and critics of this approach claim that by focusing too much on memories, it does more evil than good as it brings back painful memories that would better be forgotten. Some of these memories may even be confabulations induced by the methods used by the counsellor and do not correspond to real past events. The humanist or client centred stream is based on a particular method of listening. Critics of this method claim that the counsellor is too passive and accepting and clients who have undergone counselling this type of counselling came out frustrated with the passive role of the counsellor. Most recent approaches are known as cognitive approaches and perhaps the best known to the public is a method called Cognitive Behaviour Therapy. This method is based on certain scientific knowledge about the cognitive processes that forego in the brain and it helps the clients to question their beliefs and analyse them. Some clients are not particularly keen of this approach as it requires home work and private self-reflection, which can be difficult to achieve without guidance. We are sympathetic towards cognitive therapies but we add on aspects of evolutionary which helps understanding the natural roots of our behaviours, needs, urges and thoughts.